Many African newspapers have welcomed the selection of Pope Benedict, while warning that the church must soften its stance against condoms in fighting HIV/Aids. Some editorials are disappointed an African contender was not chosen, while others feel he is a good choice for a continent grappling with disease and poverty. The election of the German Cardinal Joseph Ratzinger as the successor to Pope John Paul II has put paid to a lot of excitement among many Africans who have been speculating about the possibility of an African Pope in Nigerian Cardinal Francis Arinze. The Africans are not the only people disappointed. The people of Latin America and Brazil have also been disappointed. With the election of Pope Benedict XVI we can be sure that the conservative radicalism in the Catholic Church is assured with all its contradictions. In Benedict XVI, the church has one of its most effective prophets and its most articulate voice. His views reflect the truth and represent the stand of the faithful majority. No matter the early reactions to his papacy, his message tells necessary truths. The church continues to refuse to transform at its own peril... There is no sound theological basis to preach against birth control methods. It is also not unhelpful for the Church to close its eyes to the HIV/Aids problem and maintain a rigid position on the use of condoms. These are the issues on which Ratzinger's papacy will be judged. He has the choice either to become a Pope for today, or to remain a prisoner to the past. The Pope has to get down to serious business immediately by addressing the issues of homosexuality, abortion and the ordination of women into priesthood. These are burning issues that would test the immediate astuteness of the pontiff within the church. We have to say we are thrilled... We are delighted the cardinals have chosen a man of great wisdom, knowledge and vast experience in the Holy See. Our country is among the few nations in the world where we have genuine religious cohabitation... The president of our republic is a Roman Catholic and his Vice-President, a Muslim. His Holiness Pope Benedict XVI may have something to learn from us after all! Pope Benedict is not likely to touch as many hearts as Pope John Paul II did because of his preference for reticence and intelligent scientific debate over dogmatic faith. To win over Ugandan Catholics, however, Pope Benedict will have to borrow the tireless wings of the most travelled Pope in history and traverse the world with his message... There is hope that Pope Benedict's past aversion to social action against poverty will not deter the global campaign for the amelioration of the negative effects of poverty, Third World debt, and unfair trade regimes. The Catholic Church is a complex creature, so change can't happen overnight... The Catholic Church is also stuck in an unhelpful position over its opposition to condom use, particularly given the ravages of Aids... The Vatican itself doesn't have to endorse condom use, but it can go round its fears by allowing Cardinals in respective territories to adopt "guidelines that are appropriate to local conditions". The Pope is not the UN secretary-general, or head of any other association, to be expected to resolve one problem or another or to act as a substitute for one or another situation. What should be said is that the new Pope should be a pastor, first and foremost, that is to say, the caring father of the people of God over whom he has responsibility. Unless the new Holy Father is willing to listen to the calls for a review of the use of condoms to fight HIV/AIDS, there could be a drift from the church. The challenge is for the African bishops to take up the cudgels against Catholic orthodoxy and campaign to save millions of Africans from certain death, from a disease which has not been tackled effectively with the doctrine of abstinence, which the church insists on. 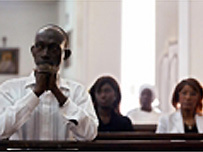 He and his African bishops will have to address the question why so many of their Catholic faithful are leaving for evangelical and pentecostal churches in sub-Saharan Africa. This phenomenon of desertions in significant numbers is also common in Latin America... The new Pope will not change the official Roman Catholic Church's stand on the use of condoms. But the question will continue to press hard and persist in the face of the Aids pandemic. John Paul II used his position as both head of the Vatican state and that of the Catholic Church worldwide to better the lot of all and sundry. He was builder of bridges... If leaders in public and private positions in Nigeria will pattern their lives after the spiritual and moral rectitude and uprightness of the late John Paul II, our society and the world in general will be a better place for all.